How to Reach: The memorial is easily reachable from Kanyakumari via boats and ferries, which are provided for the tourists round the clock. 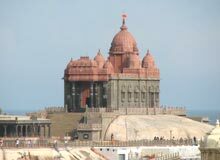 Located in the midst of the ocean, just 400 meters from Kanyakumari, is the magnificent Vivekananda Rock Memorial. This colossal structure was built in the year 1970, under the guidance of Shri Eknath Ranade. The Vivekananda rock temple is dedicated to one of the greatest spiritual philosophers of India, Swami Vivekananda. It is said that Swami Vivekananda meditated here before setting out on one of the most crucial religious campaigns in India in 1892. The idea of building Vivekananda Memorial Rock temple was conceptualized on his birth centenary in the year 1962. Vivekananda Rock Memorial was built with a blend of traditional as well as contemporary architectural styles of India. A life size statue of Swami Vivekananda has been set up inside the memorial. The rock has always been considered as holy and according to Hindu mythology, Goddess Devi Kumari has blessed the rock with the touch of her sacred feet. It is thus known as 'Sripada Parai'. In fact, there is a projection on the rock that resembles a human foot and is brownish in color, which is regarded as Sri Padam. The memorial has two main structures known as the Shripada Mandapam and the Vivekananda Mandapam. The Shripada Mandapam has the main sanctum sanctorum surrounded by an outer platform. The Vivekananda Mandapam has a meditation hall known as Dhyana Mandapam. Visitors can sit, relax and meditate over here. The atmosphere here is very calm and serene. A statue of Swami Vivekananda can be seen here. From the rock, one can check out the breath taking view of the merging of the three major water bodies namely Bay of Bengal, Arabian Sea and Indian Ocean.